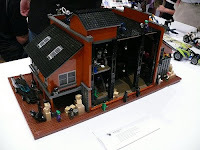 Another AFOL convention is in the books -- BrickFair came and went this past weekend in Washington D.C. A good place to view pictures is at Brick-Apocalypse, which has some of the finest buildings and vehicles from the con. The Brothers Brick has a round-up of LEGO MOCs (my own creations), including an island display -- ArchipeLEGO -- which on name alone should be celebrated. One of the Geekdads at Wired was blown away by the LEGOpocalypse -- dreary renditions of a Cormac McCarthy-istic future. Among the Brickee (trophies for best in show) winners was the Panther Ausf G.
Sir Nadroj has a photo and written account of attending his first convention. Sarah's LEGO offers a video of some of the robots in action at BrickFair. And Feed The Belly thinks about what's it like to attend a convention that appeals to kids without kids of your own.